Stocks climbed after Friday's equity slide capped off an abbreviated week of wobbly trading. HONG KONG - Nov. 26, 2018 - PRLog -- The S&P 500 rose 1.55%, or 40.89 points, as of market close. 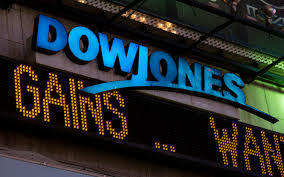 The Dow rose 1.46%, or 354.29 points. The Nasdaq advanced 2.06%, or 142.87 points. Last week marked the worst Thanksgiving week for the stock market since 1939, when the holiday was first moved to the third Thursday in November. Each of the three major indices stumbled by about 4% for the week. Crude oil prices on Monday rose after falling to their lowest levels in more than a year on Friday. Prices for U.S. West Texas intermediate crude settled higher by 2.4%, to $51.63 per barrel. The commodity had slipped about 7% on Friday, posting its seventh consecutive weekly drop. Brent crude, the international benchmark, remained about $60 per barrel, after falling 6% on Friday. Monday's rebound comes amid a crushing fourth quarter for assets across the board. The recent pullback in markets has been broad-based, hitting global equities as well as commodities from crude oil to copper to bitcoin. For the year through mid-November, 90% of the 70 assets tracked by Deutsche Bank posted negative returns on a dollar-adjusted basis, whereas only 1 out of 72 assets had posted a negative return in dollar terms in 2017. On a local currency basis, 66% of assets generated a negative return as of November 16, up from 15% last year. The fourth-quarter swoon follows a sunsetting era from between 2010 and 2017 marked by loose monetary policy, high levels of quantitative easing from central banks and low volatility, which had helped feed above-average returns. "2018 has shown signs of a reversal of this era with volatility increases and asset prices struggling in unison even with DM economies growing above trend," A Knight Investment analyst said. "This perhaps hints at how much global QE elevated ALL asset prices and overpowered the traditional relationship where bonds and equities move in opposite directions." Some analysts view the equity market rout as a readjustment following the stimulus-driven surge. "While investors have celebrated recent U.S. profit and economic strength, above-trend growth rates are unsustainable," Knight Investment wrote in a note. "2018's 23% EPS and 2.9% GDP growth are skewed by tax changes, government stimulus, and other non-recurring items. Importantly, a renormalization in growth to 7-8% EPS and 2.6% GDP should be more than sufficient to fuel a market advance." Investors will look for signs of the 2019 interest rate outlook from Federal Reserve speeches this week by Fed Vice Chairman Rich Clarida on Tuesday and Fed Chair Jerome Powell on Wednesday. Later, the closely watched G-20 summit will take place in Argentina from Thursday to Saturday, where President Xi Jinping and Donald Trump will meet ahead of the next scheduled increases on products made in China. Cyber Monday kicked off on the heels of a record-breaking Black Friday online shopping spree, according to data from Adobe Analytics. Online sales on Black Friday advanced 23.6% from last year, totaling $6.22 billion. This Black Friday was the first time in history more than $2 billion in sales originated from smartphone purchases, Adobe noted. Shoppers chose mobile over the malls this year, with in-store traffic down 1.7% on Thanksgiving and Black Friday compared to last year, according to data from ShopperTrak. Likewise, Salesforce Commerce Cloud reported 13% year-over-year growth on Black Friday, with mobile devices accounting for 67% of digital traffic. Cyber Monday sales are expected to climb more than 18% over last year and hit a new record of $7.8 billion, according to Adobe estimates. The holiday season to date has generated $44.2 billion in online sales, up 19.2% over last year. To find out more information on the opportunities Knight Investment Limited see's within the US markets, contact us today at info@knight-investment.com or visit our website www.knight-investment.com to find out more about their services and products available.